At eight o’clock on a Monday morning you may find our new Member of Parliament helping to run a football game at the local school in Kentish Town where his seven-year-old son is a pupil. “My job is keeping the peace and ensuring that the scores are fairly even,” says Keir Starmer KCB, QC, MP with a broad smile. The famous battling human-rights lawyer and immediate past Director of Public Prosecutions and Head of the Crown Prosecution Service (2008-2013) loves football and Beethoven, cooks a little and dislikes being called Sir Keir, despite having accepted the knighthood in the 2014 New Year Honours for “services to law and criminal justice”. 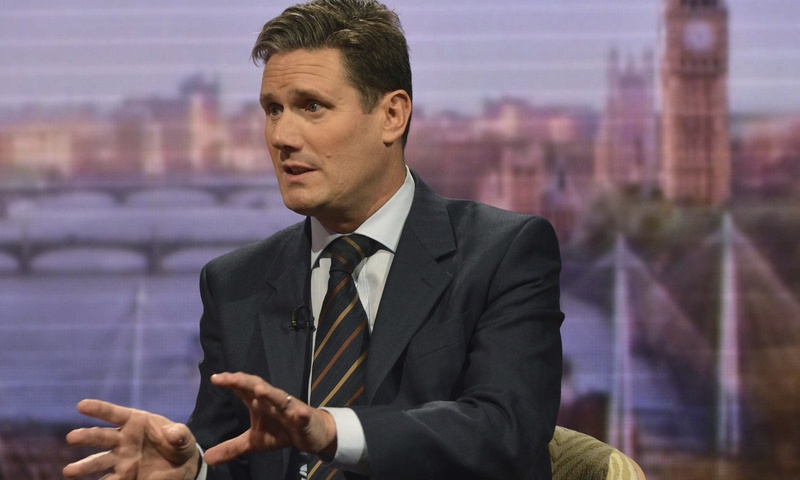 Keir Starmer was elected in the General Election in May as the Labour Member of Parliament for Holborn and St Pancras, replacing the venerable and much loved Frank Dobson who retired after 35 years on the job. The 53-year-old father of two is no big name parachuted into the constituency by the party. “I have lived in Kentish Town for 15 years and worked in Holborn for 25 years. My wife grew up in Gospel Oak, where her mum was the community doctor. Our children go to our local state primary school, where my wife is a governor,” he states proudly on his website. In fact, Keir took his now-wife Vic, a solicitor whom he met while on a case, on their first date to the Lord Stanley pub off Camden Road. “My son says I should have taken her for a nice meal,” he says with a big grin. Despite his intimidating CV, distinguished career and grand title, our very fit-looking new MP comes across as approachable and relaxed when we sit down for a mug of tea in the ground-floor atrium of Portcullis House, the parliamentarians’ offices across the road from the House of Commons. Why politics? Well, it was probably inevitable. “My dad was a toolmaker before he retired, so he worked in a factory all his life. My mum, who died just three weeks before the election, had been a nurse before becoming physically disabled. We didn’t have much money and they were Labour-leaning parents. Why decide to stand for Parliament this year? “I saw the damage caused by the 30 per cent cuts in the public services I ran as a result of the government’s policies. I felt they were undermining the post-war consensus on how we operate a modern democracy. I thought that the 2015 election would be defining,” he says with strong conviction. Electing a new leader “before debating what is our purpose” would not have been his way, and “I don’t expect an easy ride after 12 September.” But at the same time he is passionately enthusiastic about the positive surge in new members. Labour politics are so fascinating at the moment that I had to stop myself continuing down that route, as our editor’s instructions were to find out more about the man. He plays “in the middle, midfield”. Our MP laughs when I ask if this reflects his political position too. Do you teach your boy how to play? He is even more animated telling me that there is nothing worse than side-line parents urging on their child. But he does take his lad to see his beloved Arsenal, where he is a season ticket holder. Considering the team’s erratic start to the season, I decide to drop that subject. He was once quoted as saying that caring for children is harder than even his toughest legal battles. “Yes, it’s true, especially my very strong-willed four-year-old daughter who makes it her business to contradict everything her parents say,” Keir says with a mixture of frustration and pride. I mention that I read somewhere that he likes cooking. Does he have a favourite recipe dish? He looks surprised, and then without hesitation says “Tomato pasta with green vegetables, chili and garlic”.